The Justice Department sent a letter in support of repealing the entirety of the Affordable Care Act. 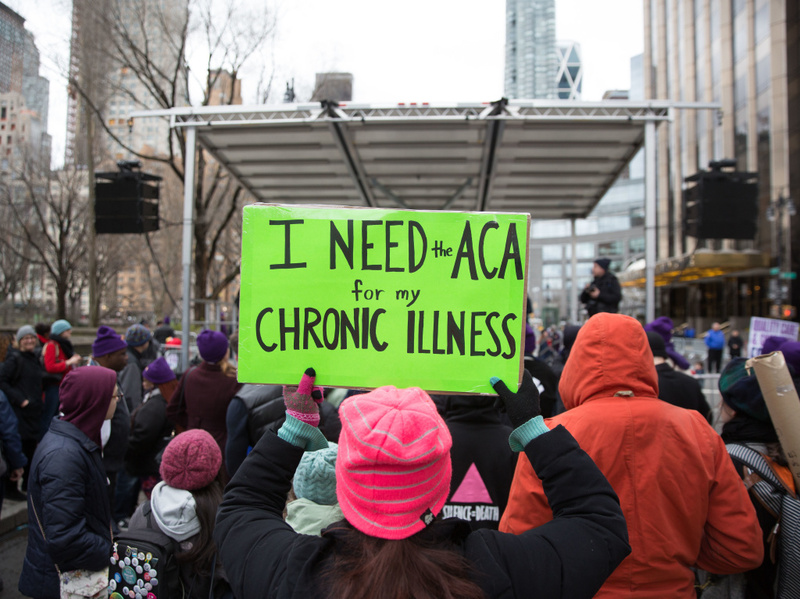 Here, a sign in support of the ACA in April 2017 in New York City. The change was announced in a two-sentence letter from the Department of Justice to the 5th Circuit Court of Appeals, that the ruling made in December by a district court judge in Texas "should be affirmed." In that case, District Judge Reed O'Connor declared the ACA unconstitutional. He ruled that a 2017 change in federal tax law eliminating the penalty on uninsured people invalidated the entire health care law. "The Department of Justice has determined that the district court's comprehensive opinion came to the correct conclusion and will support it on appeal," Justice Department spokeswoman Kerri Kupec said in a statement. The letter said the DOJ will further explain its position in a brief to be filed later. The Justice Department's letter won't change anything yet for the law, also known as Obamacare. Coverage for those who have insurance through the ACA — more than 10 million people through Medicaid expansion, and another nearly 12 million through ACA exchanges – stays the same for now. The case will continue to wind through the courts and will likely end up before the Supreme Court. If the case does land at the Supreme Court, it would be the third time that the court would rule on a constitutional question related to the ACA. The court upheld the law in 2012 and rejected a challenge to it in 2015. Meanwhile, a group of Republican state attorneys general are fighting to have the law repealed, while a group of Democratic state attorneys general are arguing to keep the law in place. In addition to the law's best-known aspects — the exchanges and the federal requirement to buy health insurance — the ACA touches every part of the health care system, from how Medicare pays doctors, to the Medicaid expansion that has covered millions of low-income people, to whether restaurants have to post nutrition information. Hospitals would have to develop new payment systems, and an entire section of the insurance industry would go away. The ACA's popularity played a role in Democrats' success in the 2018 elections, when they took back the House. Upending the law could prove politically dangerous for the Trump administration and Republicans who are backing the law's repeal. "Last night, the Department of Justice declared the entire law and all of its vital health care protections must go," Senate Minority Leader Chuck Schumer, a Democrat from New York, said in remarks on the Senate Floor on Tuesday. "Make no mistake about it, this is an escalation of the Trump administration and Republicans' attacks on protections for people with pre-existing conditions." NPR Health Policy correspondent Alison Kodjak contributed to this report.